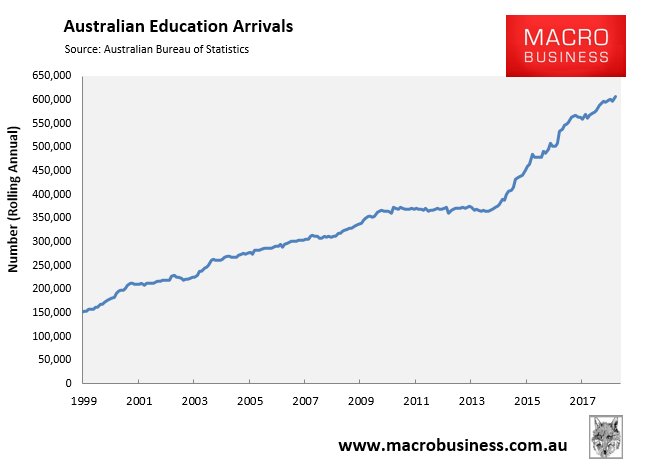 The Australian Bureau of Statistics (ABS) has released its overseas departures and arrivals figures for February 2019, which posted new record highs for both international students arrivals as well as total visitor arrivals. 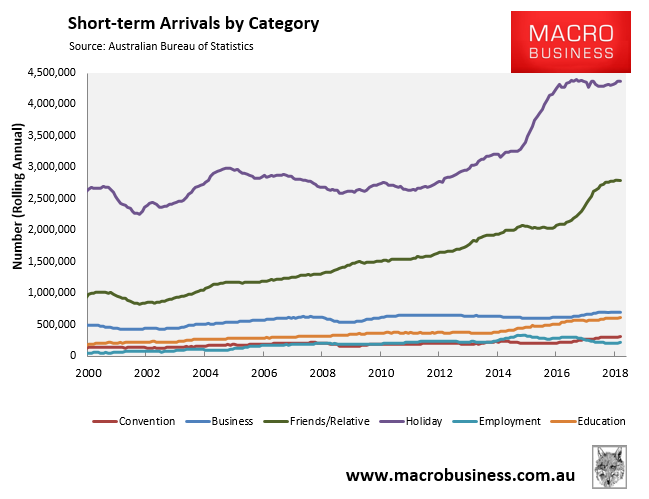 In the year to February 2019, a record 9.29 million inbound visitors arrived in Australia over the year, which was a 68% increase on a decade ago (5.54 million). 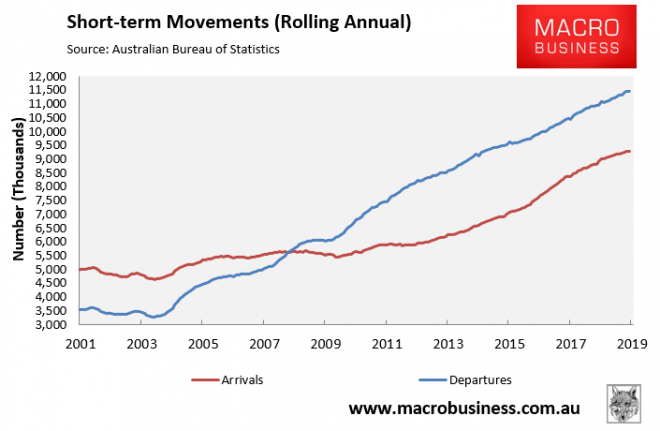 By comparison, the number of Australians traveling overseas was 11.46 million, which was an 89% increase on 10 years ago (6.05 million). 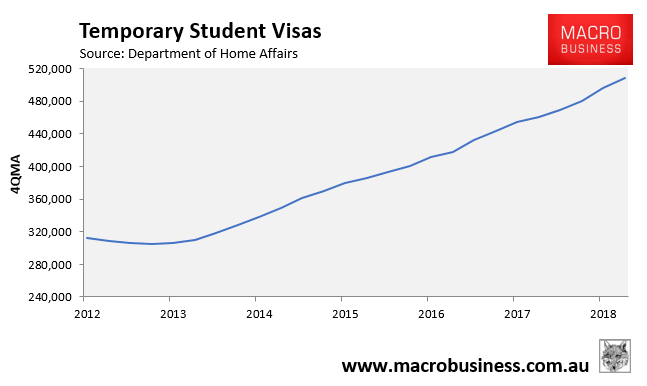 Canada is in China’s doghouse over Meng Wenzhou, the US is correctly making it harder for Chinese international students, the UK is less attractive due to Brexit = more Chinese students coming here. Those two situations seem inherently transient, and subject to overnight change with little warning. Wouldn’t want to bet too heavily on this situation lasting, or change business models or build infrastructure to cater – risk of creating white elephants seems very high. As we’re seeing more push back to immigration you’ll see state governments demanding the feds (like in SA) for more student arrivals. It’s a backdoor to boosting immigration without having the unwashed masses screaming “they took our jerrrrbs!”. Is this accounting for trade or high school courses like those run by Redhill group? 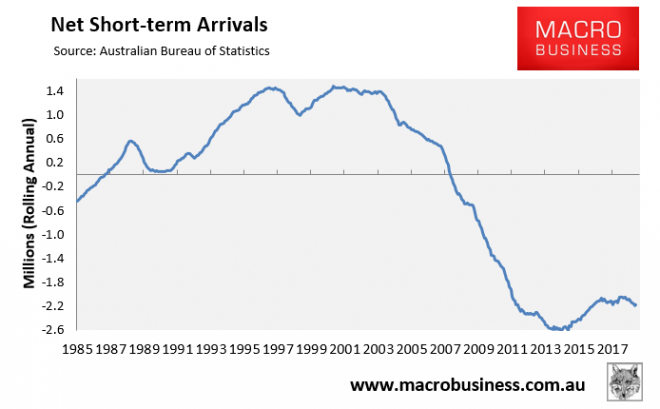 And is it any wonder ANU is the birthplace of all our so called demographers that are cheerleading mass immigration? Almost HALF of it’s students are from overseas! Be cool – the academy priesthood is on its last legs. 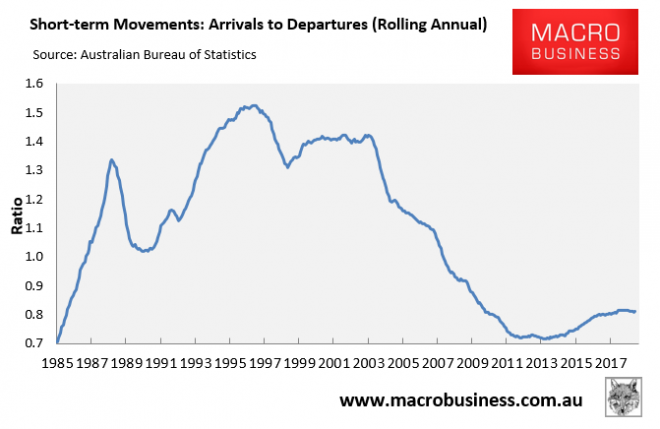 Enrolments worldwide are plummeting, with more and more people realising that universities are a credential-ism scam, and whatever ‘research’ universities produce is mostly lies. From the comments in the above link, ‘The intoxicating brew of academic freedom and tenure has left too many academics with the notion that they are free to make enemies without regard to consequences.’ I wonder if that applies to the ‘demographers’ at the ANU. However, things are looking up! as it turns out, the people in higher education have spent so long spewing nonsense, they don’t have any useful skills, academic or otherwise. They are stuck, and their only chance for survival is debasing themselves with even more ridiculous virtue signalling. Excellent. 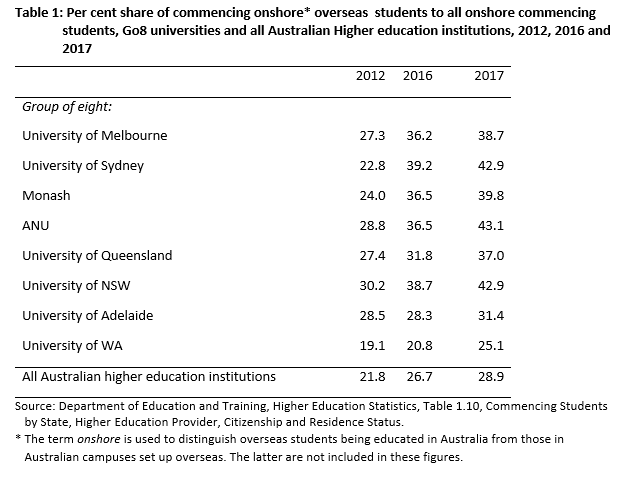 “unis” in AUS have been a scam for the last 18 years. Some say they have been a scam since 1989. Government high schools are a scam if 18 year olds do not know how preferential voting works. When I was in year 6, they tried to teach me about parliament and I was too young to be interested.